Due to a GPS software problem, all but one of our stations are failing to report data. We hope to have the situation corrected some time early next week. River levels will rise to near action stage today, but no flooding is expected. Scattered showers likely today. Variable clouds with PM showers possible tomorrow and Monday. Click the links below to view the videos about our network. The Sidney High School Flood Monitoring Program was started through a Service-Learning grant from State Farm Insurance in 2007. 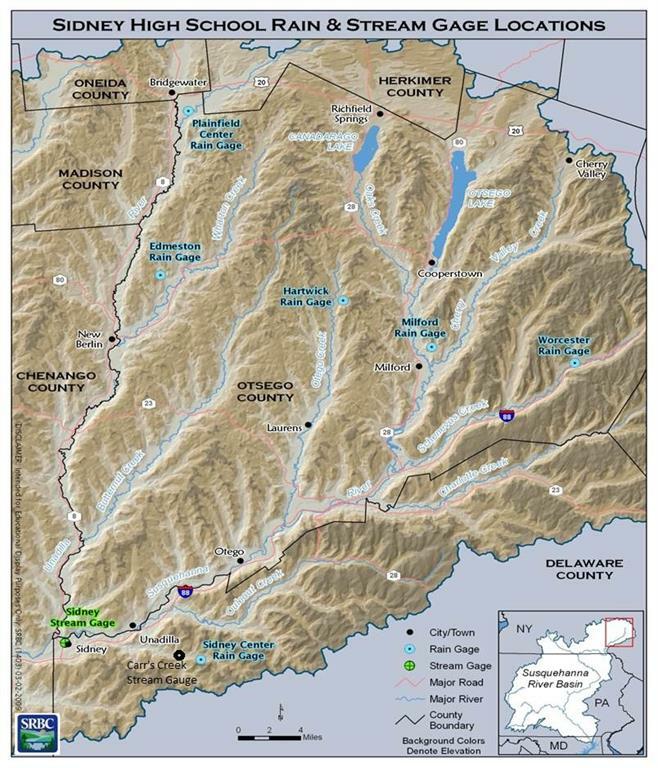 Our students have installed, and continue to maintain eight remote rainfall/weather/stream gauge stations in the upper Susquehanna River basin. These stations are located in the townships of Plainfield, Hartwick, Worcester, Edmeston, Sidney Center (one precipitation and one stream gauge station), Sidney, and Milford and are equipped with satellite transmitters. Data from these stations is sent to the GOES-East weather satellite every hour. We then download the data and data from other stations from the GOES system. Our network of stations are displayed through the National Weather Service's HADS network. This data is what we now display in our links on the right side of this page. We interpret this data, and using our mathematical model and computer model weather forecasting data, issue our Local Weather Forecasts and our Flood Potential Forecasts. You may access this information through the links above, as well as the latest graphs from our stations, and some links to important National Weather Service sites.